Teaching your kids how to count can be a boring task. Well, not anymore! Have Fun Teaching is releasing brand new skip counting songs for kids. These songs are packed with high energy beats, clapping, dancing, singing, and rapping. This counting song will teach your kids how to count by twos to fifty. 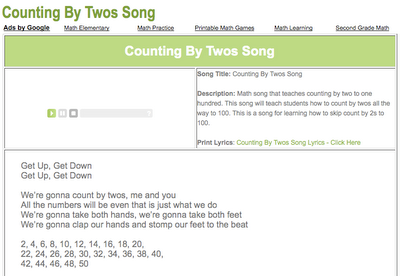 The end of the song also gives your kids a challenge by counting by twos all the way to 100! Have fun teaching your kids how to count by twos.